Damascus is the capital and the largest city of Syria after Aleppo. It is commonly known in Syria as Al-Sham and nicknamed as the City of Jasmine. 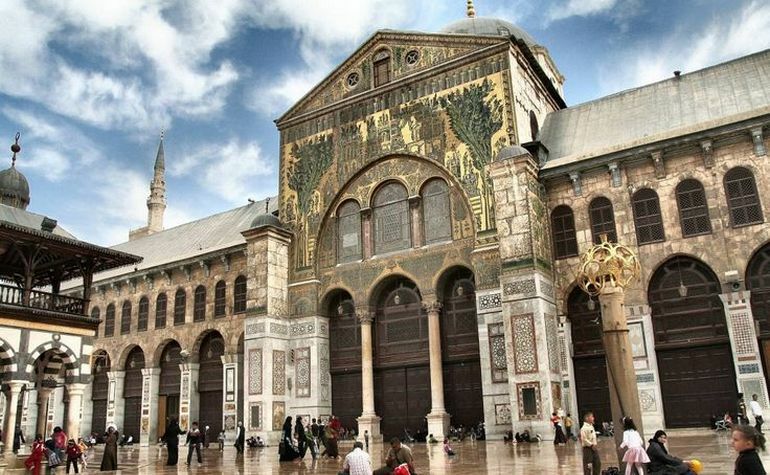 In addition to being one of the oldest continuously inhabited cities in the world, Damascus is a major cultural and religious centre of the Levant. The city has an estimated population of 1,711,000 as of 2009. Damascus was built in a strategic site on a plateau above sea level and about 80 km (50 mi) inland from the Mediterranean, sheltered by the Anti-Lebanon mountains, supplied with water by the Barada River, and at a crossroads between trade routes: the north-south route connecting Egypt with Asia Minor, and the east-west cross-desert route connecting Lebanon with the Euphrates river valley. Damascus has a cool desert climate ,due to the rain shadow effect of the Lebanon mountains and the prevailing ocean currents. Summers are dry and hot with less humidity. Winters are cool and somewhat rainy; snowfall is infrequent. Is not only the largest of five universities in the Syrian Arab Republic, but also the oldest for it traces its beginning back to the early twentieth century. The university has just entered the ninth decade of its life and still continues to raise the banner of thought, science and knowledge without hesitance or apathy. The university is keen for Arab generations from all over the Arab world, as well as foreigners, to draw from its light and drink from its trough. And even though Damascus University today is a towering structure integrating all the faculties, it started its long journey with careful, paced steps and then accelerated its steps to achieve the progress and expansion that it boasts of now. One of the largest teaching hospitals in Syria. It was founded in 1988 and is run by the Ministry of Higher Education. The hospital is affiliated with Damascus University. The General Authority of Pediatrics Hospital was established in the year 1978 in Damascus. It is considered a service educational body where medical students, postgraduates, and the Arab board receive training, and also doctoral dissertations are prepared in various specialties in addition to students of medical institutes and the nursing school of Damascus University. It is considered one of the biggest scientific, educational and service centers. It offers high quality health care and medical services for free for citizens. Syria's busiest airport is the Damascus International Airport. There are internal flights to Qamishli, and Latakia, costing approximately 10000 SP one way. The airport is relatively well-equipped with most standard services. There are also buses departing to and from Baramkeh bus station in the centre of town (airport buses are the only ones which serve this bus station now - all other services have moved to the new out of town Soumaria bus station). At the airport, come out of the terminal and turn right - you will find the bus at the end of the building. There is a small ticket office. The buses have been upgraded in recent years and have become very good. The bus will drop you a bit far from the Old City, but there many taxis around to get you there. At rush hours (10AM-4PM), the best way of transport is on foot. Smoking is absolutely forbidden in all public transport ways. A very good idea is to go on foot especially for sightseeing, and it's the only way to get around in Old Damascus. Walking in the new city however, should be reserved to the nicer areas of Malki and Abu-Rumaneh. Micro buses, also known as servees, are one of the main sources of transportation in Damascus. All journeys inside the city costs 50 Syrian Pounds. You can go from one place to another in Damascus with at most one or two journeys. The route is written (in Arabic only) on the roof sign. Micro buses do not generally have fixed stops except at very busy points. There are also many city buses that likewise cost 50SYP. Taxis are plentiful in Damascus, making them a great mode of transportation. Taxis with the Damascus Governorate logo on the side and a number on the roof sign are normally equipped with a meter, and it is best to use only these when hailing a taxi on the street. There are many restaurants in the old quarter each with their own unique character, but perhaps the most famous (and touristy) is "Beit Jabri", although "Al-Khawali" is considered by many to be the best dining experience in the old city. when considering these restaurants, is to go for breakfast, and then go sightseeing. The Nur-al-Din Bath (between the Azem Palace and Straight Street) and the Bakri Bath (first street on the right after entering the Old City at Bab Touma) are two baths that are familiar with Western tourists. 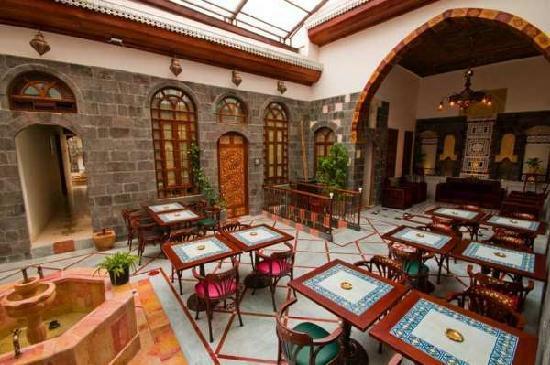 Kahwa cafe's are popular in Damascus and are easy to find. When visiting the old city, you'll get a more cultural or traditional experience. It stands at the end of Souq Al-Hamadya. This building with three minarets is an architectural wonder. It was an Assyrian temple, then a Roman temple to Jupiter, a church when Rome converted to Christianity, then a mosque and a church together, and finally a mosque until now. All the symbols are still pretty much there and some Christian drawings can still be very clearly seen on the walls inside. The mosque contains the grave of John the Baptist inside the main lounge. It is one of the most sacred sites of Islam, and it welcomes foreign tourists, who are allowed to walk around the prayer area. In the meanwhile, due to the unfortunate circumstances in Syria we will not be able to take incomings this year. However, we know by heart that war is just a chapter in our story and a nightmare that we will soon wake up from. With the global efforts that are currently being made we have high hopes that the crisis will shortly come to an end, and that you will start visiting your new family very soon.